Curated by Divine Design Center Luxury kitchen cabinets are no small--or simple--purchase. Depending on the size of your kitchen and the details you decide on, high-end cabinetry can cost anywhere from $20,000 to $50,000 or more. So when you decide to make the purchase, you also want to make sure it's an informed one that will suit both your style and the needs of your family for years, or even decades, to come. If you're unsure about how or where to start your search for your luxury kitchen cabinets, here's a helpful guide to getting started. Custom made is best. If you have a larger budget for your kitchen remodel, we almost always suggest going with custom cabinet design. Custom design is unparalleled in giving your home a high-end and unique look, and even the most expensive stock cabinetry will look lackluster next to custom designs. Choose a style, then choose a manufacturer. You'll find high-end design options to suit every decorating taste, and certain cabinet manufacturers do certain styles really well. If you love modern design, choosing a European cabinetry brand like LEICHT or Arrital is a foolproof way to get the contemporary look, but if you prefer traditional design, custom cabinetry from a reputable, local woodworking shop might be the best way to go. Think about how organized you are. The level to which you like an organized space can and should impact the manufacturer you choose for your cabinets. If you live by "a place for everything and everything in its place," you'll want to find a cabinet manufacturer who has plenty of customizable organization solutions (like built-in drawer dividers, pull out shelving, or appliance garages) you or your kitchen designer can incorporate into your design. If you tend to just toss things into a drawer or prefer a more flexible infrastructure, choosing cabinets with a ton of built-in organization might be a waste of money. There are a number of prominent luxury kitchen cabinet brands that you may want to start your research with. They're all known for great craftsmanship, high-style, and endless customization possibilities. LEICHT. LEICHT is a German kitchen cabinetry designer known for sleek styles and cutting-edge organization systems. LEICHT is best for homeowners who want a contemporary look and unique options, like lacquered, matte or colored cabinet fronts. LEICHT is available through Divine Design Center in Boston. Arrital. Arrital Cucine's cabinetry is designed and made in Italy. While they offer many modular kitchen options, nearly every detail can be customized. Arrital also offers modern style and unique materials like cement and textured glass, as well as more standard options like wood veneers. Arrital is available through Divine Design Center in Boston. Hampshire. If a traditional design is your style, Hampshire is a well-known brand that's hard to beat. Hampshire cabinetry is custom made in the company's Ohio factory. Hampshire primarily offers hardwoods like Red Oak, Maple, Cherry, and Hickory, though they can be custom finished in nearly any paint or stain color. Hampshire is available through Divine Design Build in Wellesley. Prevo. Prevo is another custom cabinetry manufacturer that skews more toward the traditional or transitional end of the design spectrum (though they can manufacturer any style). Their cabinets are made in Lancaster, Pennsylvania using both traditional woodworking techniques and modern technology to create a truly unlimited range of designs. Prevo's cabinets can also be ordered in a library of stains and colors. Prevo is available through Divine Design Build in Wellesley. Once you get an idea of brands you like, storage ideas or other must-have functionalities, or styles that catch your eye, start a design file. Whether it's a digital version on Houzz or Pinterest, or a file folder full of tear sheets from magazines and catalogs, literally collecting images and ideas can help you collect your thoughts and narrow down your must-haves. Anyone can choose beautiful cabinetry, but not everyone can design a functional kitchen. If you're going to spend money on custom luxury cabinetry, it's a good idea to set a room aside in your budget to work with a certified kitchen designer. 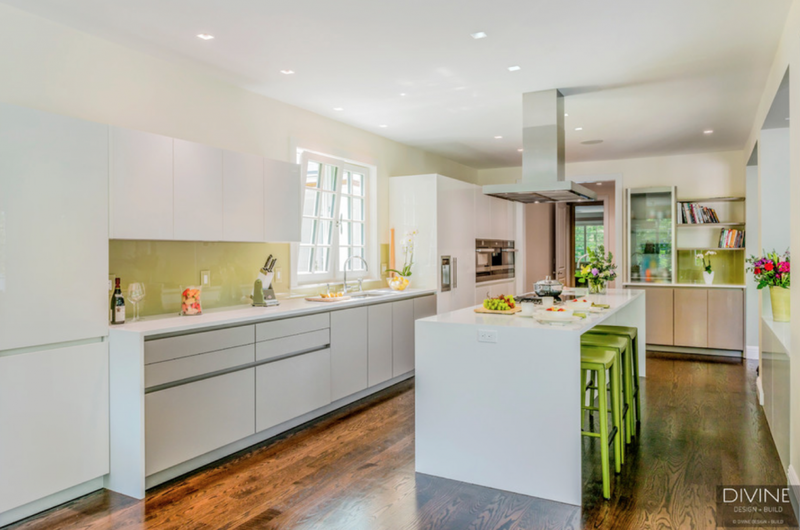 Whether the brand you're working with has recommendations they can offer you, or you find someone through word-of-mouth or Houzz, it's imperative to work closely with a professional who understands the ins and outs of kitchen design. For design inspiration for your luxury kitchen cabinets, visit Divine Design + Build online or at our showroom 180 Linden Street, Wellesley; (781) 235-5650.